Having come away with a comfortable victory on a visit to the South Yorkshire side last October, the hosts were looking for the same result at home, particularly with the visitors still searching for their first win of the season. As things turned out, Rotherham Phoenix made far better use of the elements and their spirit and determination carried them through. 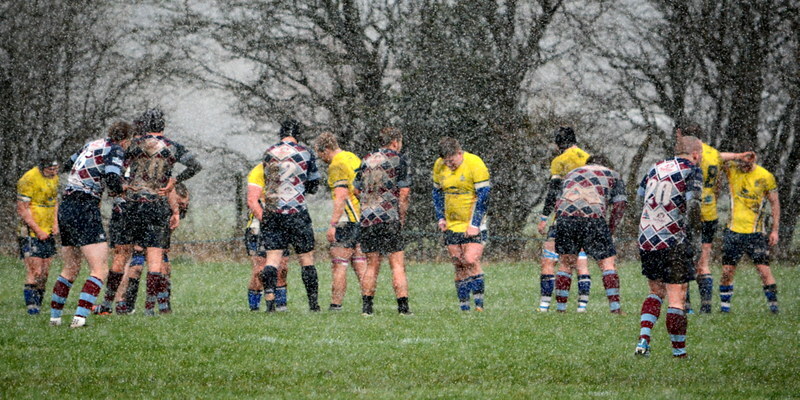 With a strong gale and periodic hail showers at their backs, the visitors soon established themselves in the home half. Their pack had an edge on the ‘Ensians eight with a weight advantage and a lively back row. On 10 minutes the impressive Rotherham No. 8 made a break and scored a good try which, with the extras, gave them a 7 – 0 lead. This came after the hosts had started so well with winger Luke Cowdell beating the cover and heading for an open line. Sadly, he suffered a hamstring problem causing him to pull up a tantalising three metres short of the line. The visitors continued to use the elements to good effect and pressure in the ‘Ensians’ 22 saw them drive over through their forwards for a second try with the conversion stretching their lead to 14 – 0 on 17 minutes. The home side were trying to put some rugby together with half backs Rob Lofthouse and Kristian Keinhorst moving the ball wide, but sloppy passing meant that moves broke down allowing Rotherham to re-group. The home scrum just about held its own, but ball was untidy putting pressure on the half backs. Flanker Sam Featherstone was holding his own in the lineouts until an injury caused him to be replaced. With the strong wind in their favour after the break, the expectation was that the home side would quickly be on the scoreboard and centre Ollie Eaves made a good break to reduce the deficit to 14 – 7 on 50 minutes with a well-taken try, Kristian Keinhorst adding the conversion. Things looked even brighter when winger Josh Howarth used his pace to carve his way through for a fine try on 55 minutes. Keinhorst’s conversion moved the score to 14 - 14 and the spectators’ anticipation was that further scores would soon follow. However, Rotherham had other ideas and their spirit and lively pack made a rare visit to the home 22 where once more the forwards drove over for a converted try to take back the lead at 21 – 14. There was time remaining and replacement forwards John Offer and Paddy Phipps did their best to inject more spirit into the ‘Ensians attack. Conditions were tricky, but nevertheless the handling by the home side was very poor and, as passes were dropped or knocked on, the visitors gained in confidence and their determination enabled to hang on for a hard-fought victory. This was a match which ‘Ensians could and should have won, but careless handling and wrong options meant that promising situations came to nothing. For their part Rotherham Phoenix took their chances and spirit coupled with determined defence allowed them to hang on for a well-earned victory.